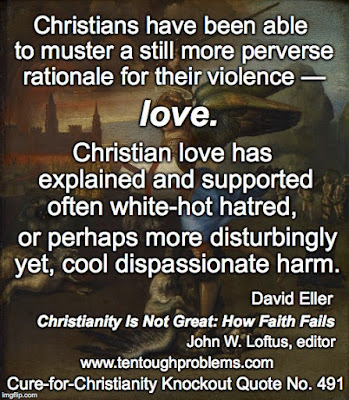 Debunking Christianity: What Is It with Christians and Violence? What Is It with Christians and Violence? If he didn’t have the patience to study Carrier’s article, I’ll assume he hasn’t absorbed the insights provided by Christopher Hitchens in God Is Not Great: How Religion Poisons Everything. There has been quibbling about the accuracy of the Hitchens’ subtitle—he insisted that he meant it—but the thrust of the book is devastating. In the wake of Hitchens’ death in 2011, a lot of Christians found out about the book for the first time, and posted the most virulent hatred imaginable on social media. I think we can count that as one of the harms done by religion: the easy flow of hatred when holy beliefs are punctured. So yes, I do care, I do mind, that people are still Christian, and that they respond to the world, to other people, as they assume their faith requires. More about that later. “You think you can paint millions of people with one tiny brush.‪” Christian history—the horrendous damage that it has done, and continues to do—provides its own indictment. Yes, I can paint millions of people with, as it turns out, a very broad brush. Millions of people have been, and continue to be, complicit in the harms inflicted by Christians and their faith. ‬‬‬‬‬ I will mention a few of the contemporary horrors later, but Christians would do well to own the history of the Jesus religion. Supposedly it has brought so many good works, so much comfort, but that is only a fragment of the story. Christians are specialists in cultivating selective memory, as well as in waving aside dismissively the crimes committed through the centuries of the ‘Christian’ era. Many Christians study the Bible—if at all—on the most superficial level, and they can’t be bothered with the history that unfolded after ‘Biblical times’—namely, the history of the church and its all-too-often violent assault on the world. The Crusades and Inquisition, for example, seem to fall below the horizon of awareness of believers today—what do they care? But these episodes of massive violence tell us a lot about how religion works…and why we should be afraid, even today—especially today. 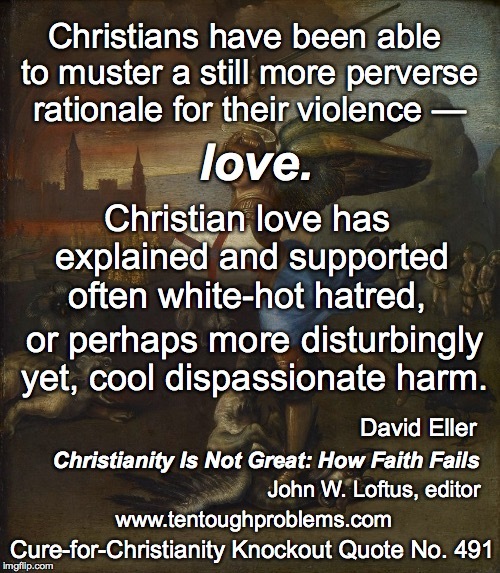 One resource for understanding this religion on-the-rampage is David Eller’s essay, “Love Your Enemy, Kill Your Enemy: Crusades, Inquisitions, and Centuries of Christian Violence,” in John Loftus’ 2014 anthology, Christianity Is Not Great: How Faith Fails. Eller reflects on how faith was transformed from early pacifism to soldiering for God and Christ—and how this militancy found expression in the Crusades and Inquisitions; in this latter case Christians put other Christians to the sword. “Oh, but that was then, this is now,” may be the refrain of those who don’t want to own their ugly history, and would have us believe that ‘true’ Christianity is a religion of peace and kindness. But no, that doesn’t work. No matter the era, whenever people act from certainty that they have God on their side, indeed that they know the mind out God, those who doubt or disagree can be in danger. Eller describes the role that Augustine played in enabling Christians to take up the sword, supposedly in order to better love their enemies. The concept of ‘just war’ had to find a champion—war for the right reasons—and Augustine rose to the challenge: “Love does not preclude a benevolent severity…love does not exclude wars of mercy waged by the good.” Eller notes, “Christianity found its doctrine of justified and loving violence in the nick of time, for the centuries after Augustine were to be particularly tumultuous ones.” (p. 91) By 622 Muhammad had achieved power in Medina, and Islam was carried as far as Spain by the early 700s. The era of the crusades came after the turn of the first millennium, and Eller provides an overview of the holy wars that ensued. And the barbarian instinct prevailed as Christians turned on each other. The apostle Paul may have set the tone with some of his hateful rants—e.g., Galatians 5:12, “I wish those who unsettle you would castrate themselves”—but the church bureaucrats sensed quite early that power was not to be squandered. Thomas Aquinas proved to be a worthy successor to Augustine, in terms of providing rationale. How many Christians have given any thought at all to one of the greatest bloodbaths perpetrated in the name of faith? Now, back to the Christian whom I mentioned at the outset—the one who doesn’t mind if I’m an atheist. I don’t know him at all, but given the tone of his response, I suspect that if he is tolerant of my atheism (why do I doubt that, actually? ), he also probably isn’t upset—maybe he’s just too dense—that Christians cause so much harm, so much damage, by their pretense of holiness, by their acquiescence in foolish, destructive theology. Misogyny, for example, thanks to the Bible, is embedded in the Christian mindset, and causes incalculable harm. The Catholic church stands out in this regard: It is officially, arrogantly, aggressively, proudly misogynistic—and, astoundingly, most Catholic women seem willing to look the other way. Likewise so many Christian denominations remain officially, arrogantly, aggressively, proudly homophobic. Misogyny and homophobia are manifestations of Christian violence.